NASA astronaut and Expedition 53 flight engineer Mark Vande Hei is pictured working outside the International Space Station during the first spacewalk of his career on Thursday (Oct. 5). He and Cmdr. Randy Bresnik spent almost 7 hours working outside the International Space Station to replace an aging "hand" at the end of the Canadarm2 robotic arm. The two astronauts will head out for another spacewalk together on Tuesday (Oct. 10). Two NASA astronauts will head outside of the International Space Station today (Oct. 10) for the second of three planned spacewalks this month. Expedition 53 commander Randy Bresnik and flight engineer Mark Vande Hei, who took a spacewalk together last Thursday (Oct. 5), will spend another 6.5 hours working outside the orbiting laboratory today. They'll continue working on the Latching End Effector (LEE), a "hand" at the end of the Canadarm2 robotic arm, which they replaced last week, and install some new high-definition cameras outside the space station. You can watch the spacewalk in a livestream here, courtesy of NASA TV. Bresnik and Vande Hei are slated to exit the Quest airlock around 8 a.m. EDT (1200 GMT). Live coverage of the spacewalk will begin at 6:30 a.m. EDT (1030 GMT), as the astronauts put on their Extravehicular Mobility Units, or spacesuits, and get ready for the day. NASA astronaut Joe Acaba and European Space Agency astronaut Paolo Nespoli will help the spacewalkers get suited up and out the door. Bresnik's first objective during this spacewalk will involve "rotating a spare pump flow control subassembly that's located on the external stowage platform 1 (ESP-1) … to set up for a future ammonia vent of that unit and eventual relocation," Judd Frieling, NASA's spacewalk flight director, said at a news conference Monday (Oct. 2). Meanwhile, Vande Hei will retrieve a foot restraint from the Crew and Equipment Translation Aid (CETA) cart and install it to Canadarm2. "In order to do that, he'll have to first install a new socket onto the newly repaired latching end effector and then insert his foot restraint," Glenda Brown, the lead EVA officer for today's spacewalk, said during the briefing. With Nespoli operating Canadarm2 from inside the space station, Vande Hei will use the foot restraint to "stand" on the robotic arm and reach a group of high-definition cameras that he'll replace. While conducting a spacewalk during shuttle mission STS-123 in 2008, NASA astronaut Rick Linnehan is anchored to the end of Canadarm2. Expedition 53 astronauts Mark Vande Hei and Joe Acaba will also "stand" on Canadarm2 during spacewalks on Oct. 10 and Oct. 18. Using a type of grease gun known as the ballscrew lubrication tool, or BLT, Vande Hei will then squirt grease into the new LEE that he and Bresnik swapped out during their previous spacewalk. 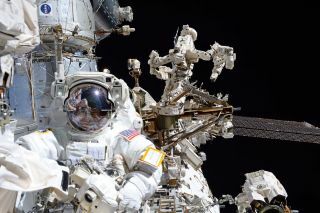 At the end of the spacewalk, Bresnik will briefly head over to the Tranquility module to remove two handrails to prepare it for the installation of a new external wireless communication system, a type of Wi-Fi network that will be installed on another spacewalk in the future, Brown said. The third and final spacewalk this month will occur next Wednesday (Oct. 18), when we'll see Bresnik head out with NASA astronaut Joe Acaba to finish lubricating the LEE and replace a few old HD cameras.